Ever since hunters first emerged, they have known only a confusing, terrifying world and have been granted only limited tools with which to confront its demons. And yet, those lucky (or cursed) few who have survived have gained deep insights into the truth. Now they emerge as the most powerful and dangerous of the imbued, but are they still human? 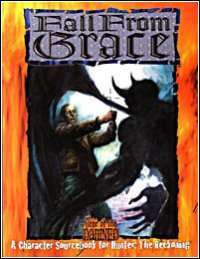 Hunter: Fall from Grace travels the roads hunters may walk to rise from ignorance to a maddening understanding of the supernatural world. Achieving these heights brings with it astonishing gifts, but at what price, and can these extremists ever see eye to eye with "lesser" imbued ever again? The next in the Year of the Damned series for 2002.